HAIFA, Israel – War is a human disaster. Not only due to the victims, but also because it brings in plain view many evil and ugly phenomena: violence, racism, nationalist zeal. The atmosphere here in Israel during the current war is one of bloodletting, that brings to mind prior periods of incitement that preceded the murders of peace activist Emil Grunzweig and Prime Minister Yitzhak Rabin. On a recent Saturday evening, July 19, a joint Jewish-Arab antiwar demonstration took place in the northern city of Haifa. Amongst the demonstrators stood Yara, a young Arab woman from Kufr Yassif and a student at Haifa University. Yara stood with a sign that read “In Gaza and in S’derot, girls want to live.” At some point a brick was thrown at her from the right-wing counter-protest. It hit her stomach. She was knocked to the ground. In a Facebook status she published after the demonstration, she emphasized that three young Jewish women whom she did not know came to her aid. Yara saw in this proof that even in difficult times, human decency transcends national boundaries. The violence was not confined to the demonstration itself. In the nearby square outside the Haifa Arts Cinema, the deputy mayor Suheil Assad and his son were attacked by right-wing activists, because they spoke Arabic. A few hundred meters away, the Hussari brothers were attacked as they left their car. A group of people moved toward them, one shouting, “Are you Arabs?” The brothers did not answer, instead choosing to flee. Their assailants caught up to them, broke the nose of one brother, and the other’s arm. When an ambulance arrived to evacuate them, it was surrounded by a furious mob, which proceeded to hit it, screaming “Death to Arabs.” If not for the courage of the paramedic, who prevented the mob from taking their anger beyond mere injuries, there would have been people killed that night in Haifa. This evil wind is not a private initiative. It’s a direct result of the fear and incitement spread by the ruling parties. If the prime minister had not called for “vengeance” immediately following the death of three kidnapped teenagers, and if ministers, members of Knesset (the Israeli parliament), and mayors had not denied the right to express criticism of the war, the outbreak of violence would not have occurred. The government and the man at its head chose the way of war. In the five years of Benjamin Netanyahu’s administration, he has conducted a consistent policy of peace rejectionism: he did not agree to freeze construction in settlements in order to allow negotiation over permanent borders, and was careful to keep saying that Abu Mazen is not a possible partner for peace. In the name of the ideology of Greater Israel, Netanyahu and his government chose to leave Israelis and Palestinians permanently on the brink of a clash, when any tiny spark could ignite a conflagration. When this occurred, instead of trying to put out the fire, they continued to pour the gasoline of incitement onto it. The events of the past weeks can create a feeling of desperation. The pain of grieving families, in Gaza and in Israel, is an intolerable burden. The knowledge that in my city, at the very place where only three years ago we created an encampment for social justice, there was a pogrom attempt against its Arab residents, is horrifying. Yet I choose to remember those incredible moments of hope three years ago, when we marched, Jews and Arabs together, in the biggest protests in the history of this country. We struggled together for social justice, and we knew that this country can be a place that is good to live in, for Jews and Arabs alike. For that hope to materialize, we must go out into the streets. One week after the demonstration in Haifa, on Saturday, July 26, I participated in the large peace demonstration at Rabin Square in Tel Aviv. That square, that has already known one politically motivated murder, is the most appropriate place to demonstrate for sanity. Indeed, it filled with thousands of demonstrators, Jews and Arabs, who called for a ceasefire. The terror that the previous week’s demonstration in Haifa had created was replaced with a hope that this Saturday brought forth in Tel Aviv. There is a peace movement in Israel, and despite attempts to silence it, its voice is not gone. 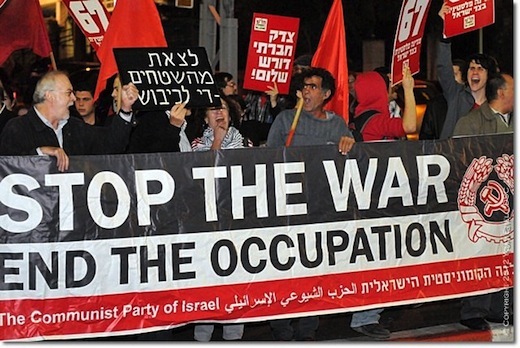 Uri Weltmann is a member of the Secretariat of the Central Committee of the Communist Party of Israel, and was an organizer of the Haifa demonstration. This article was originally published in Hebrew in “Ha’Aretz” daily newspaper, on July 29, 2014. Translated to English by Rann Bar-On.